While our immediate concerns over avian flu viruses tend to relax a bit during the summer months, the same cannot be said for swine variant viruses, which most often show up in humans during the summer and fall. Influenza circulates in swine year round, but county and state fairs - which are generally held during warm weather months - provide excellent swap meets where pigs and humans can exchange flu viruses. In 2015 we received word of 7 cases (4 - H1N1v & 3 - H3N2v), while in 2016 we've seen two cases reported (1- H3N2v and 1 - H1N2v). Surveillance is problematic, since few with mild to moderate flu symptoms are ever tested, even in the United States. So human infection is likely far more common than we know. 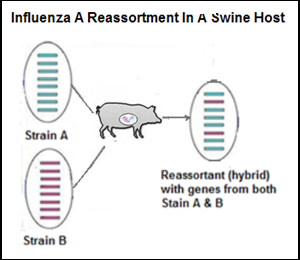 Swine are considered excellent `mixing vessels' for influenza, and human flu viruses - including H1N1pdm - are constantly being re-introduced into swine herds around the world. Today we've another study - again out of China - where researchers experimentally infected pigs with one of these Eurasian-Avian H1N1 swine influenza viruses and the 2009 H1N1pdm virus. The full study is available at the link below. When you return, I'll have a bit more. Given the present extensive co-circulation in pigs of Eurasian avian-like (EA) swine H1N1 and 2009 pandemic (pdm/09) H1N1 viruses, reassortment between them is highly plausible but largely uncharacterized. Here, experimentally co-infected pigs with a representative EA virus and a pdm/09 virus yielded 55 novel reassortant viruses that could be categorized into 17 genotypes from Gt1 to Gt17 based on segment segregation. Majority of novel reassortants were isolated from the lower respiratory tract. Most of reassortant viruses were more pathogenic and contagious than the parental EA viruses in mice and guinea pigs. The most transmissible reassortant genotypes demonstrated in guinea pigs (Gt2, Gt3, Gt7, Gt10 and Gt13) were also the most lethal in mice. Notably, nearly all these highly virulent reassortants (all except Gt13) were characterized with possession of EA H1 and full complement of pdm/09 ribonucleoprotein genes. Compositionally, we demonstrated that EA H1-222G contributed to virulence by its ability to bind avian-type sialic acid receptors, and that pdm/09 RNP conferred the most robust polymerase activity to reassortants. The present study revealed high reassortment compatibility between EA and pdm/09 viruses in pigs, which could give rise to progeny reassortant viruses with enhanced virulence and transmissibility in mice and guinea pig models. While avian influenzas get the bulk of our attention – mostly due to their high fatality rate – swine flu viruses are considered more likely to jump to humans, simply because they fall in the same H1, H2, and H3 subtypes as `humanized’ flu strains of the past 130 years. In summary, our data highlight the potential public health danger of novel viruses arising from reassortment in pigs between circulating EA swine H1N1 and pdm/09 H1N1 viruses. Such reassortants for which there is little apparent cross protection from current vaccines could be much more pathogenic and transmissible than parental viruses.